I really like how they used multiple plates for this one. I also wonder how many of these were traced from a paper drawing and how many were done freehand. I’m definitely partial to this one, just because it’s neurons 🙂 Though I also really like how they used the different colored species. And then there’s this amazing portrait of Louis Pasteur, who was a French microbiologist in the late 1800s for whom the term pasteurization (the process of killing bacteria so food and beverages don’t spoil as fast) is named. 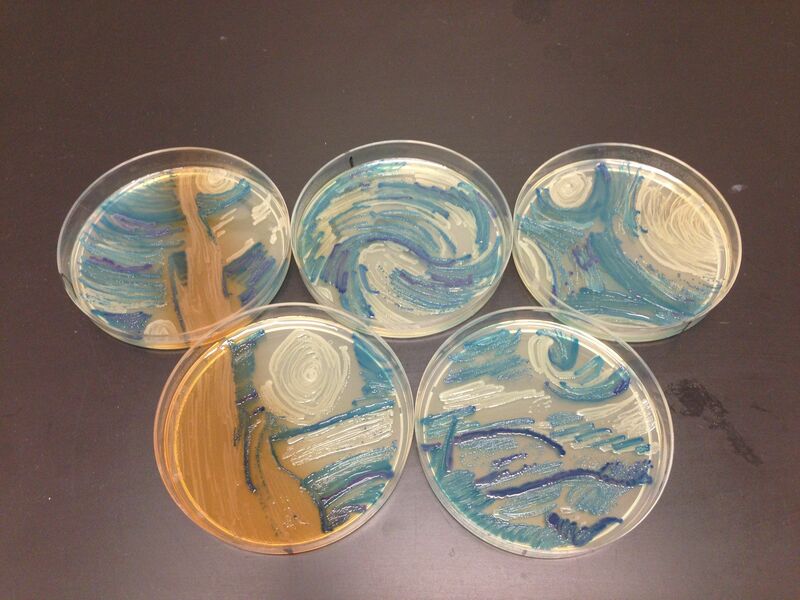 Since I’m not a microbiologist, I don’t imagine I’ll make any petri dish paintings anytime soon. But these are still awesome to see! Oh! And I do have to show one last one that was featured in the article, just because it’s so impressive. It’s a map of New York City! Yay for teamwork! I just want to say I’m still here! I’ve been a little overwhelmed with some time consuming lab work and a fellowship application due soon. My project in my current rotation has started hitting it’s stride. I know where everything is and have been trained to do everything I need to do to collect data. This just means doing the time consuming part of collecting it! For this project that means imaging live fluorescent fruit fly larvae. That means many hours at the microscope finding neurons that are (a) actually expressing the fluorescent protein in (b) larvae that aren’t too wiggling around too much. Because I’m trying to take videos of single neurons just under their skin, any movement of the larvae can completely mess up my video. So it can take several hours to get just a few videos from a couple of flies. I’m also applying to a fellowship (the National Science Foundation Graduate Research Fellowship Program) which just means a lot of writing for my personal statement and the research proposal portion of the application. The personal statement I already largely had from my grad school applications, but the research proposal involved learning a ton about a field I wasn’t suuuuper familiar with pretty quickly in order to propose an intelligent and eloquent project. But everything’s coming along nicely now and I have full drafts sent out to people to edit! I’m hoping to do a post soon about some different cool scientists through history. For instance, I’ve heard a bit about recent Physiology/Medicine Nobel Prize winner Tu Youyou. She won for her work developing anti-malarials and apparently had a relatively unconventional path to become a researcher. So I’m looking forward to learning more about her career and work and then sharing that with all of you! Someone recently sent me this excellent article about a study suggesting a correlation between artistic hobbies and scientific success! Actually one of the things I love about biology research is how much it has in common with arts and crafts. I’ve been a DIYer/crafter for as long as I can remember, including sewing, crocheting, knitting, woodworking, painting, etc. And so many of those types of projects and hobbies are about problem solving (especially since I sometimes jump into projects without planning them entirely through, haha). And that is absolutely true in research. Oftentimes the tool you need doesn’t exist or is just prohibitively expensive. So we often make things out of tape, pipette tips (plastic tips for measurement tools), glass slides, cover slips (thin sheets of glass), or grease (those are just what I’ve used in the past month). In one lab I was in, we had a behavior assay that used an upside down piece of tupperware with some graph paper taped onto it and a cell phone vibration chip glued on the underside. I also know some neuroscientists use cut up coffee cans to block electromagnetic waves (from things like lights) from showing up in their data. 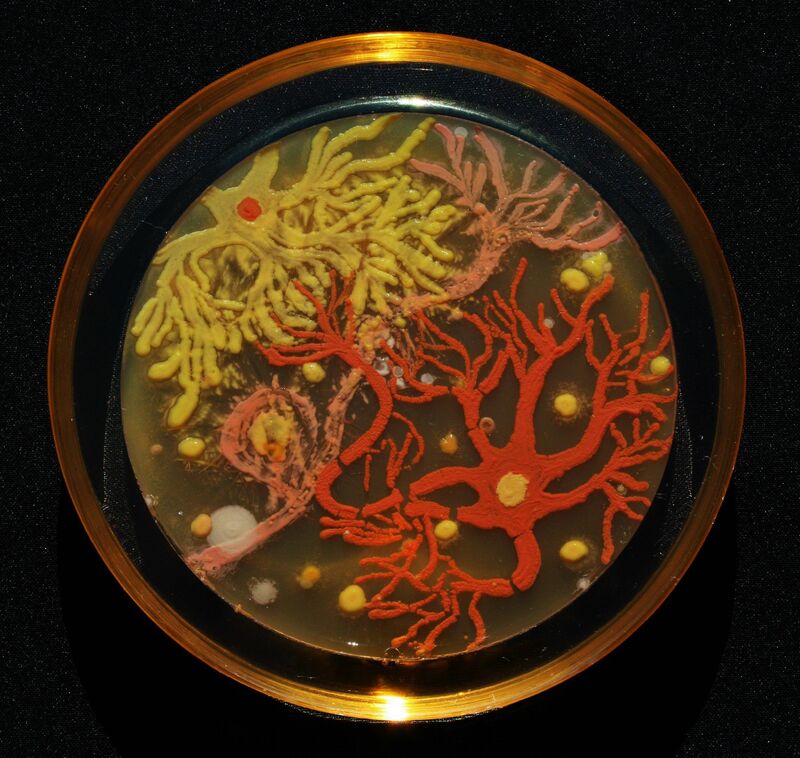 So to end, I’ll leave you with an NPR piece on The Amygdaloids, a rock band made up of neuroscientists and an article about Alexander Fleming’s (the discoverer of Penicillin) petri dish paintings. New Rotation, New Model Organism! I worked with fruit flies (Drosophila melanogaster) for the first time today! And it actually wasn’t so bad! I’m really not a fan of bugs, especially flying bugs, especially near my face, so I was a little worried it would be horrible. But they stay pretty well contained in their plastic vials, then on the carbon dioxide releasing pad that we put them on to work with them (the carbon dioxide anesthetizes them so they don’t move). Of course some flies inevitably escape, so I was worried the fly room would be filled with flies all around. But there were actually fewer free flies in the fly room than in my apartment, haha, so not bad at all! I’m in the first semester of my first year, which for typical biology PhDs means I’m currently doing rotations. This means I spend a few weeks in a few different labs before I choose the lab I’ll be doing my thesis project in, which for PhD programs in the sciences, is typically 4-6 years long. Choosing a lab is therefore a huge decision; it determines your boss and mentor, your coworkers, and your day-to-day tasks for a long time, not to mention your training as a good scientist. First, a bit about lab structure: a lab is run by a Principal Investigator (PI). They’re basically the boss, and they’re also the teacher for the students and employees in their lab (depending on the PI, they may be different combinations of boss/teacher). Labs usually have a couple of graduate students (I’ve heard numbers ranging from 0 to 20, though fewer than 10 is much more common). Then there are two common types of employees: lab technicians and Post Docs. Lab technicians are typically people with a bachelor’s degree who do a lot of the support work to keep everything in the lab running smoothly (like making reagents, ordering supplies, and maintaining equipment are common). Post Docs (Post Doctoral Fellows) are people who have gotten their PhDs and are working as more independent scientists, but don’t have their own lab yet and are working under the guidance of the PI. This is a very common position for people to get right out of grad school and is considered an important stepping stone before starting their own lab. Finally, it’s common for labs to have undergraduates working part time (often for school credit) or over summers or school breaks to learn the basics of lab research and get experience. Now a bit more about rotations. Biology PhD programs are unusual in that most have rotations. With other research-based PhD programs (physics, chemistry, and outside the sciences like history, literature, etc), it’s more common to go to a specific program at a specific university to work with a specific person. People will decide beforehand what type of research they want to pursue, find someone doing that, and apply to a program specifically to work with them. Then when they start their program, they begin working with that person right away. While this does happen in biology, it’s very common to instead do rotations. if I get along with the PI and if their mentoring style works for me. For instance I don’t want someone checking in with me all the time. I like to work much more independently, but be able to ask for help when I need it. Some people prefer to work with someone who can work side-by-side with them a lot more. Other people have other preferences. But rotations can basically be a test run to see how you like your boss (if only all jobs had this!). if you get along with the rest of the lab members. These are people you will be spending at least several years with, so hopefully they’re people you like! Also is it the type of lab where everyone talks to one another all the time, or where they work independently and stay focused? I like to hear what other people are doing and bounce ideas off people. But some people get distracted by that and prefer to work in a more quiet, focused environment. Neither is better or worse, but you have to make sure it works for you. if you think the research is interesting and important. It’s hard to get out of bed every day for 5+ years if you think what you’re doing is boring or useless. I just finished my first rotation on Friday (which is why I haven’t posted in a few days. Friday was super busy!). It went really well, and I enjoyed it a lot. But now I’m switching gears entirely starting tomorrow! Well, not entirely entirely. I’m still studying the cytoskeleton in neurons. But this lab looks at things from a biochemistry (instead of more cell biology) perspective (so understanding things based on protein structure and a slightly smaller scale; though really biochemistry and cell biology overlap a lot and have more in common than not). Also I’ll be working in fruit flies! This is the first time I’ll be working with flies, and I’m excited, but also a little nervous that I’ll hate it (I’m not a huge fan of flying bugs in general). But there are some really cool things about using fruit flies for research: we know a lot about them so you don’t have to reinvent the wheel to get a lot done; they’re so small you can put a whole developing larvae under the microscope and still be able to see tons of details in real time and in a living organism; and they’re really easy and cheap to keep and take care of! *Cytoskeleton=rigid structure of actin and microtubules that gives cells shape, provides organization, and acts as a transport system in the cell. Neuron=brain cells that send electrical signals and are the basis of all your thoughts and feelings. When people say “brain cell”, this is the one they’re talking about, though there are actually other types of cells in your brain. Also I know biology can be really confusing at first just because there are so many terms. And I’ve been using them for long enough that it’s hard for me to know what terms people are familiar with and which ones people don’t know. So if I ever use a word you don’t know the meaning of, definitely ask!